I asked Fat Bruce Lee if he would rather go with me to re-review Father's Office or Norms. Without hesitation, he chose Norms. The 18-month old memory of Father's Office was still too painful for him. His decision was fortunate, since the president of Norms had recently reached out to me in light of the less than favorable review they had previously garnered. He suggested that they were having an off day and a second chance was in order--The BurgerBusters are all about second chances. Heck, I have been to Father's Office on three occasions. We made our way to the West Los Angeles (Westwood) location on Pico Blvd--parking was free in the huge, attached lot. Norms was full to capacity...it almost always has been whenever I have driven by. We were fortunate enough to have a table open up just as we walked in. 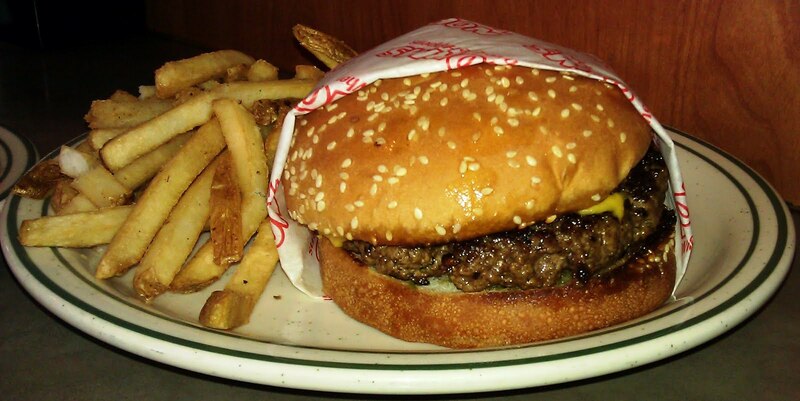 It was with some trepidation that I ordered that second burger at Norms, but I am glad that I did. That first experience was, in fact, nothing like the burgers that we sampled on the second try. 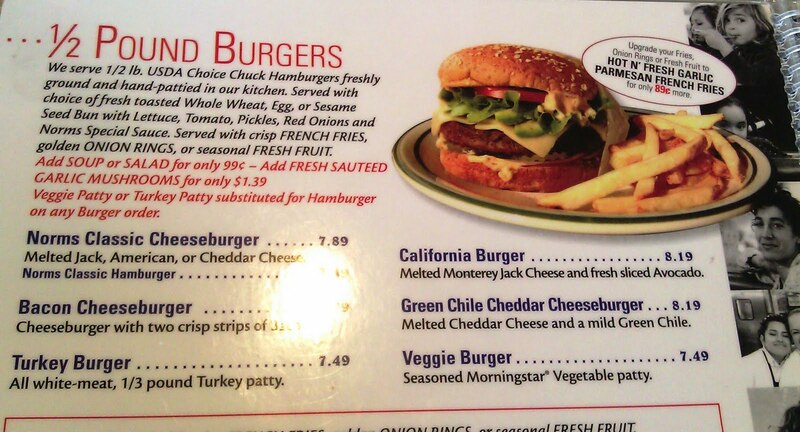 The Beef: The burgers at Norms were made from 100% USDA choice Chuck. The place was really busy, so I did not have time to get an in-depth look into the preparation process. I assumed that Norms took regular delivery of ground beef. The 80:20 beef was quite good. It was pleasantly juicy without being greasy. The bite was nicely balanced. It led with a mild funk that tasted of wet-aging. The middle note in the bite was a strong, beef flavor, and this melted into a mellow, but hearty, note of iron. The texture was tender, bordering on crumbly, and this was likely due to the fact that the loosely formed patty was overcooked. It was not unpleasant, and the sturdy bun and cheese held the dish together from a textural and a structural perspective. 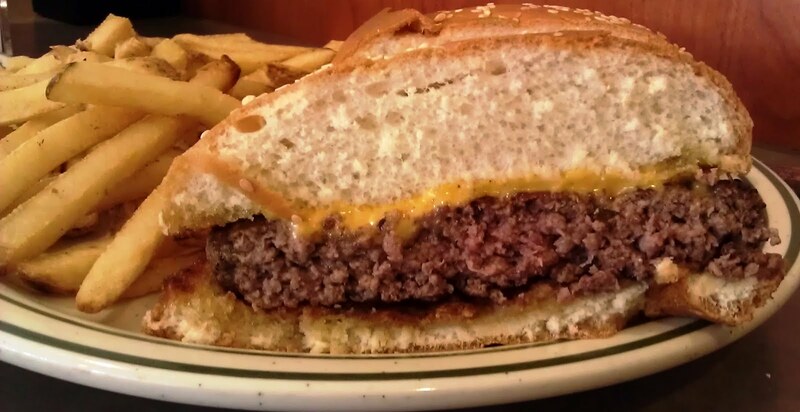 The Seasoning: The interior of the burger patty was unseasoned, and the exterior was lightly salted as it seared on the flat top. The seasoning was mild but appropriate in consideration of the strongly flavored beef. The Sear: The sear on the burgers at Norms was solid. It was crisp and dark, and it lent a welcome firmness to the bite. The Preparation: The freshly ground beef was formed into patties periodically. The grind was medium. Norms was a 24-hour establishment, so there was no morning prep time. The beef was handled gently, so there was no chewiness in the bite. 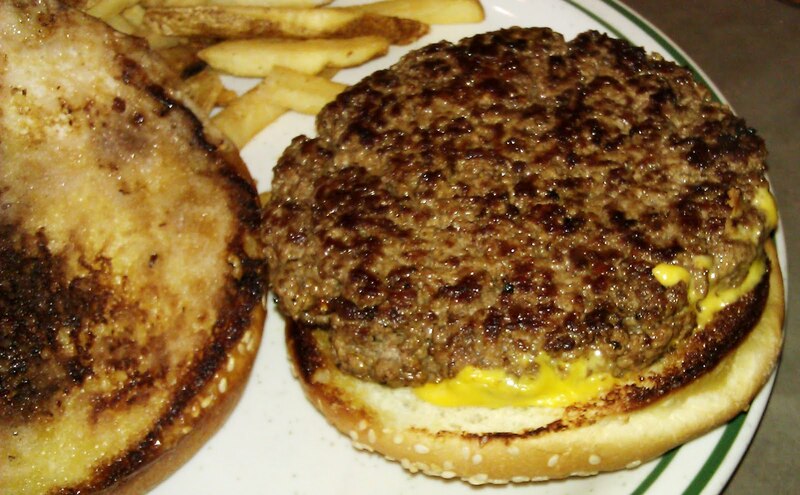 The 8 ounce patties were cooked on a properly hot griddle/flat top. My burger was cooked to Med-Well in spite of being ordered Medium, but this was fine. The higher cooking temperature served to melt all of the collagen in the Chuck to develop that strong beefy flavor. This also allowed a better sear to develop. The trade-off was the crumbly texture of the beef. The Cheese: The melted American cheese slice served to balance out the texture and provided some umami and creaminess to the bite. The Bun: I went with the sesame seeded bun rather than the whole wheat or egg bun options. The moist, fresh was buttered and toasted to a satisfying crunch. The bun was otherwise neutral, and it it did not detract from the flavorful cheeseburger. The Fries: These were peel-on fries, and they were cooked to a proper crispness. They were unseasoned, so this made them bland. Otherwise, the fries were completely competent. The Toppings: The Romaine lettuce that accompanied my cheeseburger was fresh and crisp, and the tomato slices were juicy, ripe, and sweet. The Value: An 8 ounce cheeseburger with fries was $7.89 at Norms. Two cheeseburgers, fries, and two soft drinks came out to just over 23 bucks after tax. The value was average. However, compared to what we encountered a week prior at Boxwood Cafe by Gordon Ramsay, this burger was far superior in terms of both ingredients and preparation. 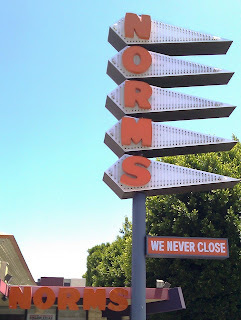 We walked into Norms with low expectations, and we walked out pleasantly surprised. I brought half of my burger back to the world headquarters for the minions to sample (Lord of the Flies-style). Everyone agreed that this was a fine and flavorful burger, which they would gladly eat again. The unseasoned fries were not a hit. On a final note, the pancakes were darn good when sampled on previous breakfast runs with Happy Meal. Burger Review : Norms served up a better than average burger for an average price. Norms is a solid choice to satisfy a burger craving....especially a late-night one, since they are open 24 hours. They were certainly head and shoulders above Apple Pan and Islands, which were both within half a mile of the Westwood location. Try not to be funny. Try hard. It's imperative. Trust me. I was really pleasantly surprised. I ran the second half of the burger past three other people, and the all agreed on a "better than average" rating.